Ideas to Creations is a blog about turning ideas into as-professional-as-possible creations in Motion Graphics, Digital Art and Visual Effects. Plenty of tutorials and inspiration coming at you regularly! There's also a free ebook on After Effects Expressions Basics and the i2c Presets Pack which are all free, available on the "FREE STUFF" page. Last edited by davdalx on 02/24/2013, 1:53 pm, edited 6 times in total. New Post on Ideas to Creations: How to use dingbat fonts like Webdings and Wingdings in Windows. Comments would be greatly appreciated thanks! How to add pseudo-3D glow in After Effects. This tutorial will include how to use the "lookAt" expression, and also share a preset "Face Camera" so you don't have to memorize the tedious code and process. Learn the basics of expressions and how to use some common code, arrays, variables, and lots more. For beginners to intermediate users. Creating soft shadows in Adobe Photoshop in a very simple process. Here's a tut on using CC Particle World and how to link the Producer's odd co-ordinates system to a Null object from a tip on this forum. Another audio-less video for AE Challenge! In this tutorial, we look at how to join a bunch of null object with a line and allow them to move around. Focussing on the process of getting there and solving a problem, rather than jumping to the solution. In this tuturial, a follow-up to the previous one (above), we'll be looking at how to keep the points joined when the Nulls are parented to other layers. There'll be a short math lesson and a look at how parenting affects a layer's transform properties. In this for-bloggers post, I'll explain how to add Google's +1 to Blogger, which can also be translated to work with other platforms. In this post, I explain two fun apps that help designers, and AE and other users alike, on picking the right colors for a project! Tell us what you use and how you pick your colors! In the first instance of the Discuss tag, I'm asking you to share scripts you like and regularly use in After Effects, Photoshop and Cinema4D. Recommend it to not only me, but also all other creatives out there! Also, if you've made your own scripts, this is your chance to share it with everyone! In this fun post, learn how to create a Red/Blue 3D scene to be viewed with Red/Blue 3D Glasses, and also construct your own 3D Glasses. Combine two views to one, how to set up the cameras, it's a long but awesome tutorial! Feel the Void needed a new ident for their upcoming short vidz. Here's a concept for it. Learn a simple shortcut to assist in aligning similar layers, such as background plates, in After Effects. The process also applies to Photoshop, and any other application that supports Blend Modes. Enjoy! Please drop a comment and let me know what you think. Much appreciated! In this inspiration post, I'll be sharing some videos that involve clones that I found on YouTube! Also, there's some earlier posts, such as the preparation for the upcoming "Presets Pack". 6 free and handy presets for After Effects!! Coming very soon!! NEW VIDEO: Fancy holographic watch! Check out some quick info for this test video for an upcoming project! NEW VIDEO: Abstraction. Done in C4D! The i2c PRESET PACK is finally out! 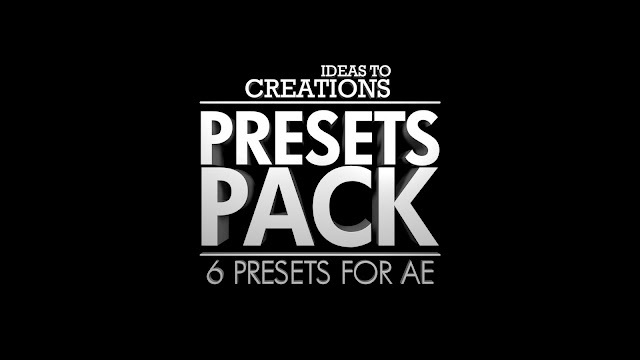 6 presets for AE that make life easier... and more fun! A first tutorial in 3D program Cinema4D, Learn how to make lights bounce off of surfaces using Global Illumination, as well as some interesting settings to play with. Learn how to create the retro-ish blocky text as seen in the "intro recreation" video. Simple and quick process. Cheers! Don't forget to drop a comment! Your appreciation is appreciated! Have you wanted to write tutorials? Want to give a behind-the-scenes or breakdown of something you did recently? Well then, this is your opportunity. Ideas to Creations is looking for writers. It's a simple process that will only take a few minutes. Get blueprints and set up C4D for modelling... awesome!